Happy Friday! If you’re like me, you have no problem finding ways to use up your tomatoes since you just slice ’em up or pop ’em in sprinkled with a little salt. But, if you’re looking for some ideas, here are a few delicious recipes to jumpstart your weekend. Have a good one! I hope all is well this morning. We really hope you all have enjoyed the Spring Session of the CSA. It has been a challenging season with the rain and cool weather. As early as it seems, we are beginning to contemplate the Fall season. With all the rain, we have had a little more time to contemplate some creative additions to our Fall season line-up including purple broccolini florets. Nothing starts the day off better than a fluffy omelette, stuffed with delicious summer veggies and a little goat chèvre. I may have left mine in the pan for a few seconds too long, but in my defense, I had to entertain a kid tugging at my pant leg, hungry and impatient with anticipation from the delicious buttery scent. 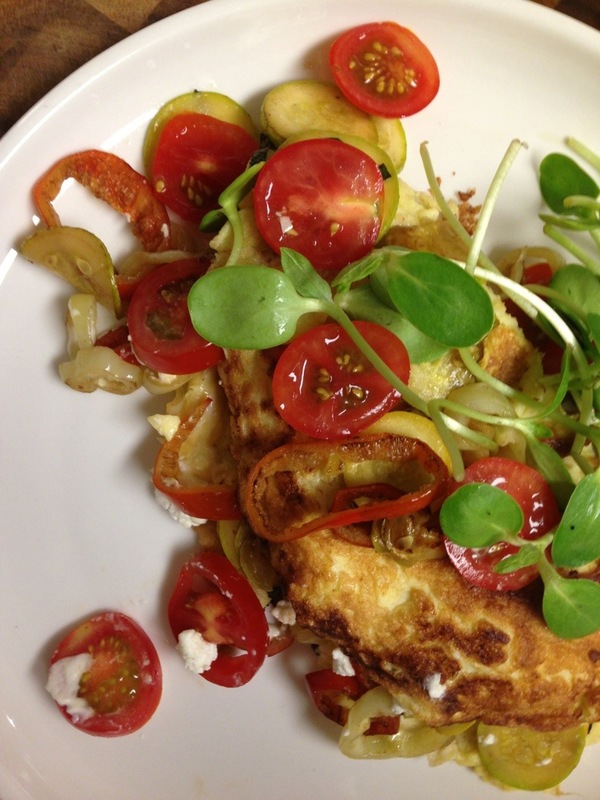 Need to brush up your omelette making skills? Jacques Pepin will tell you everything you need to know… Go here. I hope all is well. We have been loving this sunshine ( and I, myself, love some heat)! We have been working with Community Guilds, an educational non-profit, over the last week to help give a few high school students an apprenticeship opportunity. The goal is to provide pragmatic, non-traditional classroom lessons as well as some trade skills to these young folks. They have been working with us on the farm weeding and harvesting as well as talking about running a business and interacting with community. As part of their culminating project, they have made a few delicious food items from farm food with the guidance of a local chef. Today at the CSA, they will have hot pepper jam and basil lemonade available for sale. Please stop by and say hello to these diligent and cool young folks. We also welcome McKenzie, our Decatur Farm to School apprentice, for the next two weeks. This week, we have sunflower shoots, grown in the Gaia greenhouse, and tomatoes! I hope all is well! The farm is slowly, but surely staring to dry out a little and we were incredibly happy for a little sunshine yesterday. In personal news, I woke this morning to learn that my new nephew was born. It is incredibly exciting. This week we see the arrival of delicious tomatoes. We hope you all enjoy! Hello, Hello! Hope you all had a fantastic holiday weekend! I promise to get creative in the kitchen soon, but in the meantime, here are some links to delicious summer eats from around the web… We’ve been all about this goat grilled cheese lately and the twist on the baba Gannouj is divine. Enjoy!